In January 2017, Yanci Panameno was “saddened” when Governor Jerry Brown released his budget proposal for the 2017–18 fiscal year, which would have suspended funding for nearly 3,000 new preschool slots in the state. At the time, the child development specialist and mother of three in the San Fernando Valley was struggling to find affordable child care for her 2-1/2 year old son, Michael. “It’s a real problem, not just for us, but for so many families in the community,” Panameno said then. 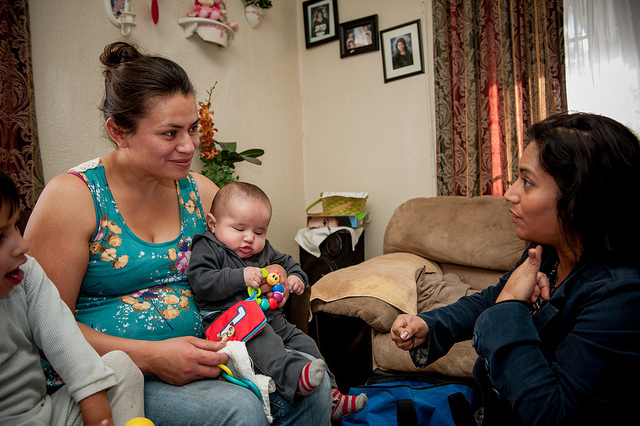 Home visiting is one of First 5 LA’s signature investments. This includes Welcome Baby — a free, voluntary program for Los Angeles County pregnant women and new moms that provides information, support and a trusted partner to help them through the journey of pregnancy and early parenthood. Thanks to additional funding that came through last year to fund new preschool slots after the governor and state legislature agreed to a final budget last summer, Panameno was able to finally enroll her son in preschool last fall. And while her own son is now benefitting from early education, Panameno knows how important affordable, available preschool slots are for other families in her community, where she serves on the First 5 LA-funded Best Start Panorama City & Neighbors Community Partnership. “The more opportunities to enroll a child in preschool, the more children will be prepared for kindergarten,” she said. First 5 LA joined L.A. County parents like Panameno in their praise of Governor Brown’s budget proposal, which are squarely aligned with First 5 LA’s own priorities. 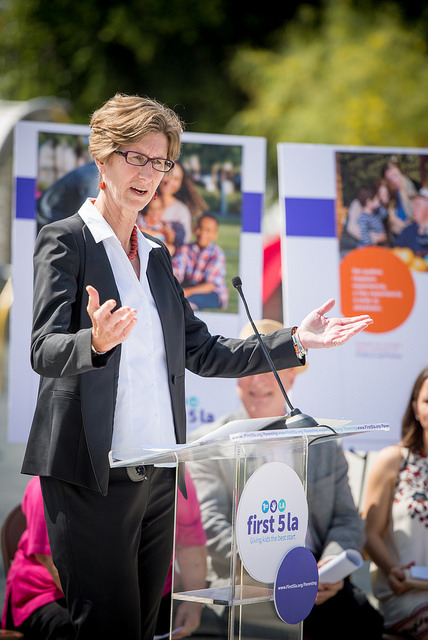 Belshé noted the proposed budget takes an important step in prioritizing funding for multiple supports for young children, from pre-and-post natal support offered through home visiting, to health coverage, to quality early learning. In the coming months, state legislators will review the governor’s proposed budget and begin to craft their versions of the annual spending plan. The Legislature’s final budget decisions typically wait until after May, when the governor releases a revised budget that may modify his January proposal based on economic and revenue updates. The Legislature must pass a budget bill for the upcoming fiscal year by midnight on June 15. The governor has until June 30 to sign the budget bill into law. In the past, policymakers have not prioritized investment in a child’s early years, even though research shows that 90 percent of a child’s brain is developed by age 5. California’s families face significant challenges, as well. For example, 1 out of every 5 children in California live in poverty, and in L.A. County the child poverty rate is even higher at more than 28 percent. Parents with two children may pay nearly half their wages for child care in L.A. County, and statewide more than 1.2 million children do not receive the subsidized child care services for which they are eligible.